At the moment I’m going through the professional edit of my second novel, and it occurred to me that some of you out there may not know about the facilities offered by word processing software (Microsoft Word and similar) for critiquing work. 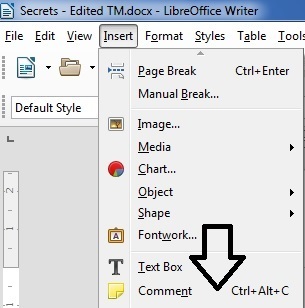 I use Libre Office, which is a free Microsoft Office clone, so the explanations and screen shots will be from there, but the principles work in most word processors. Once you know what’s possible, you just have to find your own version on the menus. When you critique a piece of writing, you want to be able to suggest changes in the text to improve it or correct spelling or grammar errors. You do this with the menu option Edit/Track Changes/Record Changes. I think Microsoft Word may call it Track rather than Record. Notice that Show Changes is selected too – you want to be able to see them! 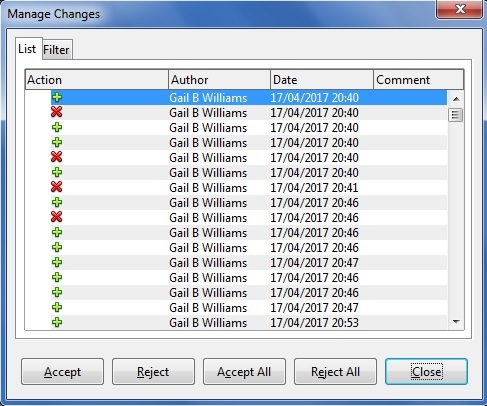 The result is that when you change anything in the document, it is marked in a different colour. Changes can be made by more than one person, in which case they appear in a different colour for each person. When you receive a document containing changes, you need to go through and Manage Changes. 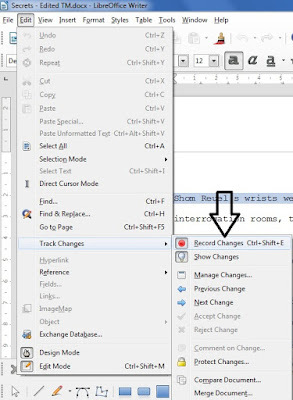 Make sure the Show Changes is still selected and then select Edit/Track Changes/Manage Changes (seen on the menu above, below Show Changes). A box appears with all the changes listed. 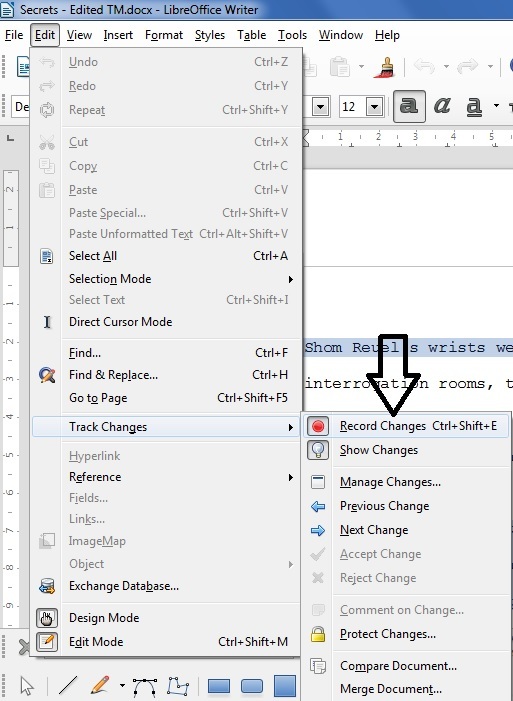 The first change is highlighted in the list and in the document. Accept it and it will be implemented, Reject it and it will be removed and the text returned to the original. Here is the text above with all the changes accepted. The sharp-eyed will see that there is actually an error – one of the words (‘put’) should have been deleted and the person marking the changes missed it. You still have access to the text to manually make any alterations you want, so you can correct it yourself before going on. As you can see from the box above, in a short piece you can Accept All or Reject All. I wouldn’t recommend it in a long piece – better to go through it slowly. When critiquing, you may not want to make changes to the text, you may just want to make comments at certain points. Of course, you can simply type in your comments, but that can get confusing, and the recipient has got to delete them all afterwards. Instead, use the Comment facility. 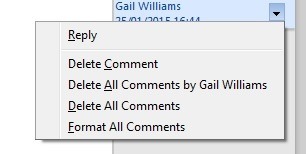 Put the cursor where you want to comment and select Insert/Comment. A separate space appears beside the document with a box for your comment and an arrow to the text. Comments can be any length, but long ones can get confusing, so keep it short and refer to notes at the end. Comments can be made by more than one person, in which case they appear in different colours. When you are reviewing comments, and probably taking action in the document, or deciding to ignore them, you will find a drop down menu in each comment box. So no matter how long a comment is, you can delete it with just two clicks. If a document is going to be passed back and forth, you also have the option to reply. I hope you find this useful. I’ll let you know how my edit review goes – my manuscript is over 300 pages long!